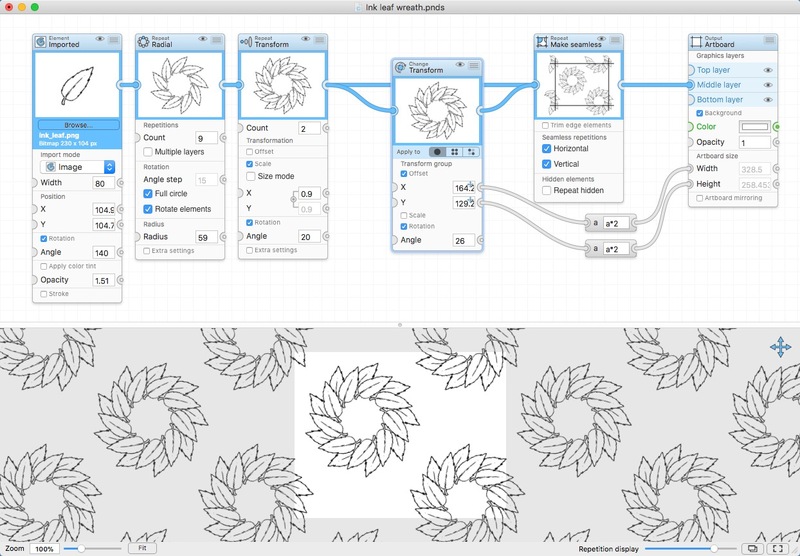 Patternodes is a tool for creating graphical patterns, animations or illustrations based on repetitions. This is done by defining a sequence of steps, a recipe or sorts, that describes the pattern. Each pattern element or operation is represented by a little panel called a node, and the nodes are then linked by connections drawn between them. As the nodes can be freely combined and connected this gives you a very flexible and powerful interface. While the software can be used to create any type of repeating graphic, it's primarily aimed at pattern creation. To make pattern creation easier Patternodes also includes a lot of nodes that automatically perform common tedious tasks like repeating elements at the tile edges to make the pattern seamless, or randomizing different aspects (like color, position, rotation..) of the elements in a pattern to give it a little more life. Finally, when you're done you can simply copy the pattern tile into whatever illustration or graphics application you use, or export it either as vector graphics or a bitmap image file.